Students trying to navigate the strategy jungle may lose sight of the fact that strategic management is about creating value in an organization. Understanding strategic management is a core part of all business qualifications and this textbook brings a new and easy-to-follow understanding of this vital business function. In addition to walking the student through the basics of the subject, the authors provide an array of analytical tools to help facilitate a thorough understanding of strategic management. The book addresses thoroughly the impact of financial markets on a firm’s strategic capabilities, as well as looking at other challenging environmental factors. 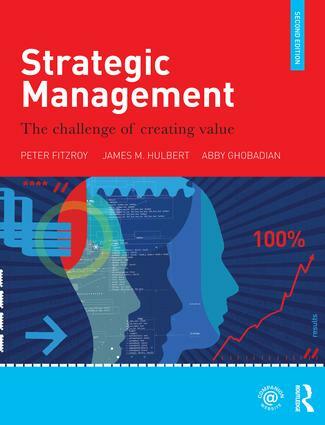 Aided by an array of student-friendly features, such as: learning objectives, 'strategic management in practice' case studies and review questions in each chapter, Strategic Management will help students to excel in their strategic management classes and better prepare them for the real business world. A comprehensive companion website, containing a wealth of supplementary materials for students and lecturers alike, is available at: http://www.routledge.com/cw/fitzroy.